W L Wyllie (1851-1931). W L Wyllie (1851-1931). Watercolour signed and dated 1916. This is a Wyllie watercolour telling a fascinating story of a little known theatre of allied naval operations in WW1 – the Adriatic. Although Wyllie has (unusually for him) dated his painting (1916) he has not annotated it with the event and its from Wyllie’s and M F Wren’s “ Sea Fights of the Great War” (1918) that we can be sure of the scene he has painted. 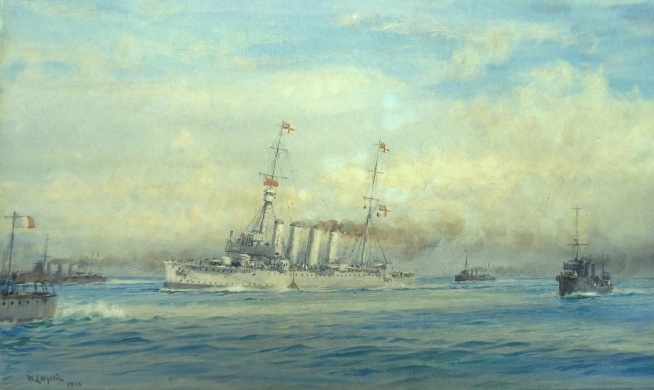 Page 138 of the book carries a grey wash and pencil image of this very event depicted in the watercolour - although slightly different aspects of the ships shows the book image represents events a mere minute or so later. Was the grey wash image in the National Maritime Museum’s collection subsequently worked up into this very watercolour? The Light Cruiser HMS DUBLIN was first commissioned in March 1913 and Captain John Kelly took command of the ship in the Mediterranean on 21st July 1914, a momentous time indeed for a young and ambitious officer to be returning to sea. Days later and now just before the outbreak of WW1, DUBLIN was involved in the infamous chase of the two German ships GOEBEN and BRESLAU which resulted in GOEBEN seeking sanctuary in Constantinople: shortly afterwards Turkey entered the war on the side of the Germans. John Kelly in DUBLIN and his brother Captain Howard Kelly, commanding a sister HMS GLOUCESTER – coincidentally also involved in the interception and long chase of the Germans - were amongst few of those who came out of this incident with credit although to be fair to Admiral Sir Archibald Berkeley Milne, C-in-C Mediterranean Fleet, Winston Churchill, First Lord of the Admiralty, severely and consistently confused things at several critical junctures by trying to run things from his desk in Whitehall 1500 miles away! Some 6 months later in February 1915, DUBLIN was moved to Gallipoli to cover the landings there and then in May 1915 she moved south through the Aegean and Ionian Seas and into the Adriatic where she was based in SE Italy, at Brindisi. While taking part in a sweep off the Albanian coast escorted by French and Italian destroyers, DUBLIN was hit and damaged by a torpedo fired by the Austrian submarine U-IV on 9 June 1915. The cruiser put shot mats over the hole on the port side and shored up damaged compartments and so was able to get underway at 17 knots and was escorted back to Brindisi. Wyllie’s watercolour clearly shows DUBLIN with a decided list to port and with a shot mat over the port side plugging the torpedo hole and held in place by lines running forward and up onto the foremast. The stern of a French destroyer (possibly of the Bouclier Class) is in the left foreground leading the group, and busy screening the limping DUBLIN to deter further submarine attacks are Italian destroyers of the Indomito Class. There is much here of interest, not just the joint nation composition of the force in which DUBLIN is operating and the fact that it was an Austrian submarine who fired the torpedo. Back in the North Sea the German Imperial naval ensign was causing confusion because of its relative similarity with the Royal Navy’s white ensign: their Lordships had a plan! On 2nd September 1914 HM Ships were ordered to fly an additional blue ensign when closing for action or possible action, but four days later this was revoked in favour of a Union Flag. Then from November 1914 to the beginning of 1916 the red ensign was to be the additional battle flag and here (June 1915) Wyllie – always a stickler for his naval detail - shows DUBLIN duly wearing her red duster at the fore. HMS DUBLIN was duly patched up to enable her to make the passage back to UK for permanent repairs and she then joined the Grand Fleet in Home waters where she saw action at the Battle of Jutland being heavily damaged by shellfire. Further scrapes followed in subsequent Great War actions but by 1920 she was out on the Africa station where she served for 4 years before briefly returning to the Mediterranean station. She was taken out of service for scrapping in 1926 but whilst under tow to the breakers in Troon, Scotland, she managed to frustrate her executioners and ran aground. It was a while before she could be refloated and finally delivered to the breakers. Her captain from those days in the Adriatic, John Kelly, went on to become one of the RN’s legendary admirals of the 1930s. Following the Atlantic Fleet’s mutiny of 1931 it was "Admiral Jo" – so called by the lower deck where he was respected but popular because of his well known sympathies with them and down to earth approach to life – who was appointed to sort out the problems, and by all accounts he made a first class job of this to the discomfiture of several of his fellow admirals whom he considered had not distinguished themselves in this sorry incident and whose careers subsequently suffered . He finished as C-in-C Portsmouth and was promoted Admiral of the Fleet: a few days later he died suddenly. His brother Howard from HMS GLOUCESTER – we know the two famously could not abide each other - also went on to be a Commander-in-Chief: China Station in his case - and the two admirals had two highly achieving sisters too who delighted in banging the heads of their sailor brothers together in an attempt to get them to be civilised to each other. C-in-C China's flagship, HMS PETERSFIELD, ran aground in a typhoon and scarcely concealing his delight at his brother's embarassment, C-in-C Portsmouth, on hearing his brother was safe, signalled C-in-C China "Glad you're safe". "Glad you're glad" came the surprised, laconic reply!